Despite its 7 minute 58.4 second record subsequently being beaten by 4 seconds by a Megane RenaultSport 275 Trophy-R, SEAT was still first to smash the 8 minute time for a front drive hatchback around the Nurburgring Nordschleife. 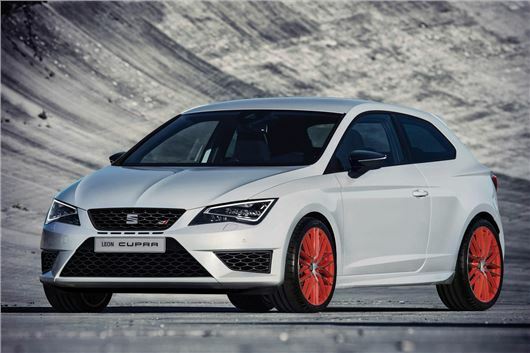 Now SEAT has launched a 'Sub8' performance pack for the car at £2,025. This includes bigger 370mm brake discs, Brembo 4 pot callipers, specially-designed 19-inch alloy wheels in either black or orange and body-coloured side skirts. Semi-slick Michelin Pilot Sport Cup 2 tyres are also available, for £460, which is £540 less than Renault charges for them for the Trophy-R.
And to make it look the part two two coloured exterior packs are also on offer: Black-Line and White-Line for £500. Finally, CUPRA bucket seats at £1,250. These feature a one-piece head restraint and come clad in black Alcantara with simil leather bolsters and white accents, with embossed CUPRA logo. The price also includes Winter Pack (heated front seats and headlight washer system with heated front washer nozzles).